A team of paleontologists and geologists from Argentina and the United States found a lanky dinosaur that roamed South America in search of prey. They announced the discovery on Jan 13, 2011 where the age of dinosaurs began, approximately 230 million years ago. 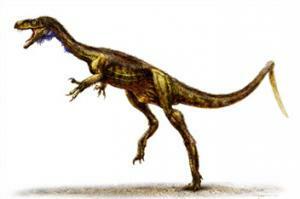 The new dinosaur has been named as Eodromaeus, (dawn runner). It weighed only 10 to 15 pounds with long neck and tail. Paul Sereno, University of Chicago paleontologist reported "It really is the earliest look we have at the long line of meat eaters that would eventually terminate in Tyrannosaurus rex near the end of the dinosaur era”. Paul Sereno and his colleagues illustrate the complete skeleton of the new species in Jan14, 2011 issue of the journal Science. The paper describes the dawn of dinosaurs era. In red cliffs on the extreme side of the valley, larger plant and meat-eating dinosaurs had evolved many times the size of Eoraptor and Eodromaeus. But it would be even later when they dominated all land habitats in the ensuing Jurassic and Cretaceous periods. Paul Sereno said, this story suggests that lucky break for dinosaurs but rather a long period of evolutionary experimentation in the shadow of other groups. "The dawn of the age of dinosaurs," Martinez remarked, is coming into focus.